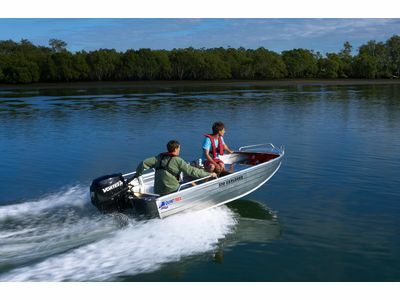 Quintrex Cartoppers & Explorers are the classic Australian fishing boat. Due to their smaller size, these boats can easily steer through rivers, dams and estuaries in order to find the best fishing spots. 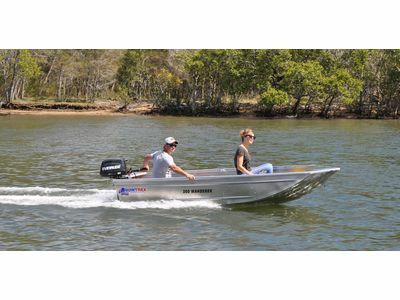 Our cartoppers are small fishing boats that can easily be securely strapped to the top of the car for transporting. Our range of cartoppers & explorers vary in price, so whatever your budget, there’s a fishing boat to suit you. This Trophy has some serious power. With an overall length of 4.52m and 60hp rating, it has more than enough gumption for wahtever the day may bring. This boat is built to fish! 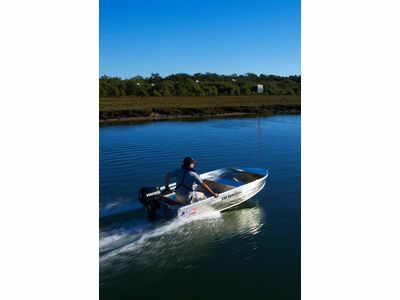 The F420 Explorer Trophy includes all the bells and whistles such as a carpeted front and rear casting platform, moveable pedestal seats, extruded side decks and underflorr flotation. A Complete fishing package for those wanting to land that perfect catch. This is a stable boat with front and rear casting platforms, plenty of storage and room for your mates and their fishing gear. The F420 Explorer is the tinnie that ticks all the boxes. with its wide beam, Fighter Series Hull and maximum horsepower rating of 40 this tinnie is guaranteed to get you to where you need to go. The 3rd and largest in the Outback Explorer range is the F390. Built on the Fighter Series Hull for extra strength and stability, this model is built to last a lifetime. The F390 Explorer is an economic option to spend your weekends in exploring hidden fishing spots. The 2nd in the Outback Explorer range is the F370. The 370 Explorer is a perfect companion for caravan holidays. This model is both versatile and practical;with incredible stability at rest and underway and precise handling. The Outback Explorer range comes in 3 sizes and they are wider and deeper than the standard Explorer model. The first in the range is the F350. Offering a little more room to move the 350 Explorer can still be transported atop of most utes for extra adventures when travelling. A one piece Solid T Keel gives extra durability when loading. This pint-sized power packet is a great little car topper or tender weighing in at only 63kg and measuring 3.24m. The 360 Wanderer now has a new V-nose for smoother riding than a traditional style punt. It weighs just 53kgs and other than the additional length it has the same beam and specs as the 320 model.